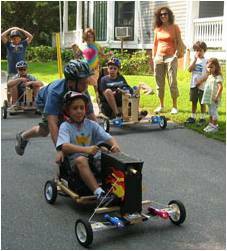 Build-It-Yourself partners with a number of summer day camps in the Boston area to offer our popular BIY Missions in a fun, activity-filled one-week format from June through August. BIY's trained and experienced team of college student mentors descend on Boston like King George's Redcoats and set up camp at some of the finest summer bivouacs in New England - like Concord Academy, Lawrence Academy, Park School and others. You can meet and team up with a whole new group of friends and fellow builders as you design, swim, program, lunch, construct, laugh and show off your robots, flying machines, websites, soap box racers and more. Summer camp is a great way to sample Build-It-Yourself's unique approach, and many of the 200+ campers we serve each year are returnees or have joined BIY's @ Home Webcast offering as Rookie Builders. Camp Directors, or parents who are interested in bringing BIY's proven student engagement approach to your summer camp, can contact us at support@build-it-yourself.com for more information.